KIEV, Ukraine -- On Oct. 1st the Constitutional Court of Ukraine voided the so-called “political reform” of 2004 and thereby effectively returned the country under the legal framework of the 1996 Constitution, which established Ukraine as a presidential-parliamentary republic in the mould of the French system of government. Basically, the difference between the 1996 and 2004 Constitution is like a difference between good seasoned Bordeaux and young wine that went sour right after it was made. The 1996 document crowned a 5-year-long constitutional process involving experts, lawyers, active politicians and the civil society. The 2004 “reform” was a circumstantial behind-the-scenes compromise hastily handcrafted to avoid bloodshed in the wake of “Orange revolution”. In all the years that went by I never met a lawyer who agreed that the 2004 decisions were legally justified. It is unanimously recognized that they were passed in a violation of procedure, circumvented any kind of public debate and were the result of a political compromise at the cost of law. This was maintained both by the Venice Commission and by many Ukrainian politicians, including the current oppositionist Yulia Tymoshenko. While the Oct. 1st decision returns sense of logic and responsibility to the governmental structure of Ukraine, the substance and basic course of the foreign policy will remain unchanged. Ukraine will continue to be a European democracy, dedicated to the EU-integration and strategic partnership with Russia and the US. While it seeks new partners in the world, it doesn’t aspire to become a member of the NATO or, for that matter, any other military alliance. Thereby it ceases to be Europe’s problem and becomes a new promising venue for the East-West partnership in the modern world. 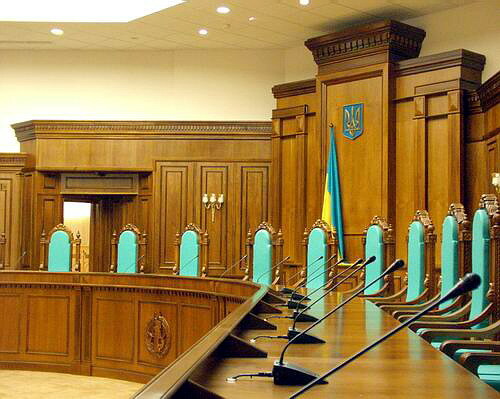 The increased powers of the President will be used to streamline Ukraine’s policy. After a number of years when too many cooks “spoiled the broth” in Ukraine’s Government, the democratically elected President of Ukraine re-emerges as the consolidating figure that both steers the course of reforms and takes responsibility for its success. Remembering how difficult Ukrainian elite found it in recent years to agree on every single step on their way, Ukraine was bound to adopt a change of its political routine. The fact that this transformation comes via the Judiciary, in full accordance with Ukraine’s legislation and under almost unanimous (17 ayes and 1 nay) support of the Court members, speaks in favour of Ukraine’s democracy. As the objectives of Ukraine’s policy remain the same, the speed of Ukraine’s movement to achieve them must change. For many years Ukraine’s main handicap was not the lack of declarations, but the lack of an effective, Europe-oriented, reform-minded policy. The Oct. 1st decision changes this. As it fills in Ukraine’s judicial loopholes and defuses the legal “mines” left by the 2004 “political reform”, its repercussions will be far-reaching, for it puts in place the missing piece in Ukraine’s political “jigsaw puzzle”: the accountability of those at power. In the 2010 election the voters vested in Mr.Yanukovych not only the presidential authority, but the hope that Ukraine finally gets its act together. Its eternal political drama didn’t only test the patience of the outside observers. It was hard – first and foremost – on Ukrainian people, who expect from their government the same things as any other people in any other part of the world: to provide for a peaceful environment, a stable economy and a positive future for their children. As the legally doubtful, politically ambiguous “reform” of 2004 was one of the things standing in the way of these expectations, there is no doubt: it won’t be missed.